This is probably the best way to go about tuning your RZR 170 CVT transmission! 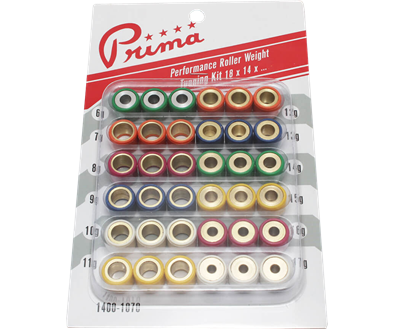 Included in this tuning Kit is 12 sets with 3 rollers each, for a total of 36 roller weights. These sets range from 6g to 17g. Combining 2 sets of rollers allows you to tune with a large variance of weights sets! 3x 10g & 3x 11g rollers (alternating weights in variator) gives you 10.5g roller set. DANGER: weights must be put in a 120 deg pattern! If not, SEVERE ENGINE DAMAGE WILL RESULT!!! TIPS: Lighter roller weights will increase RPM for any given road speed. Heavier weights will lower RPM for any given road speed. All of this, of course, must be tailored to each person's engine set-up & personal driving style!! Looking for more performance upgrades? These weights can also be used as part of our 170 SUPER CLUTCH SET!